Death Wolves are a rare species that live in Northern Russia. To separate them from the normal wolves, they usually have a black covered body all except for a white tummy. They mostly break into restaurants where people get eaten or steak and meat gets stolen. 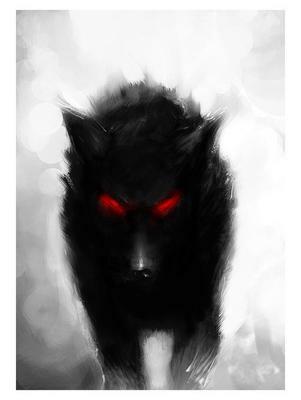 The Death Wolf has red eyes. The ordinary wolf ignores it and it also has the power of hypnotism. Its red eyes flash green when it is hypnotising and stay red when not. It has two inch long golden claws that can slice through stone, wood and reduce it into dirt. It is afraid of glitter and annihilates rubber ducks. It is also scared of chilly sauce. The Death Wolf licked its chops as it entered the Mexican restaurant and hypnotised a human into giving him some taco mince. He then ate the human as well and pounced on another human. The Death Wolf slid out his retractable gold claws and chopped the second man in half. The Death Wolf's tail stiffened and spikes of iron came out. He then also beat a woman to death. The Death Wolf simply licked the blood off and escaped into the night.